Updated Friday March 16, 2018 by Darren Burbank. In Field: The sprinklers should be turned on for 2 to 10 minutes to moisten the diamond dust and then the in field should be smoothed out using the drag behind the gators or pull behind broom/rake. Each field has a valve in the equipment shed or in the landscape vault that will turn on the water. There is a hose in the shed that should be used to spray the areas not covered completely by the sprinklers. Diamond dust should NOT be drug into the batter boxes nor onto the portion of the mound from the rubber towards home plate. Bases: The three bases are located in the equipment shed of the field and are hanging on pegs. There is a rubber plug that needs to be taken out to allow the base to be installed. There is a tool in the shed that can be used for removing the dirt from inside base sleeve and off of the base foundation so the base sits level after the base is installed. Chalking: The 1st and 3rd baselines, batter's boxes, catching box, and base coach boxes need to be chalked. There is a metal template of the batter box located in the shed that is used to create an imprint in the dirt. The chalking machine is then pushed over the imprint. There is a string line that is used from the back of home plate and ran past 1st and 3rd base to create straight baselines. Bases: The three bases need to be removed and the rubber plug inserted back into the hole prior to dragging, brooming, or raking. The bases need to be stored in the shed on the pegs provided. DO NOT throw the bases on the floor. Baselines: The first and third baselines are critical to maintain correctly. The diamond dust needs to be raked from the base towards home plate so that the diamond dust is not raked onto the grass. DO NOT rake perpendicular to the baselines. The grass edges adjacent to the baselines will dry up if diamond dust remains on the grass for a period of time. 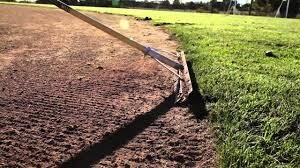 Batting Boxes and Mound: Use clay from the shed to repair any holes in the batting boxes and on the mound. Before making repairs, rake or broom away any diamond dust, repair the holes, tamp down the clay to make the surface compact, and then rake or broom the diamond dust back over the area to make is smooth and level. In Field: The sprinklers should be turned on for 2 to 10 minutes to moisten the diamond dust and then the in field should be smoothed out using the drag behind the gators or pull behind broom/rake. Each field has a valve in the equipment shed or in the landscape vault that will turn on the water. There is a hose in the shed that should be used to spray the areas not covered completely by the sprinklers. Diamond dust should NOT be drug into the batter boxes nor onto the portion of the mound from the rubber towards home plate. The grass edges adjacent to the infield will dry up if diamond dust remains on the grass for a period of time. Dugouts: Both dugouts need to be cleaned and swept in preparation for the next team. Locks: The equipment sheds need to be locked after all of the equipment is returned and properly stored.